This game has been on every system that I can think of but it originally saw the light of day at the Arcades in 1984. This Sega version came out 6 years later. So, has it kept its Arcade feel and graphics? 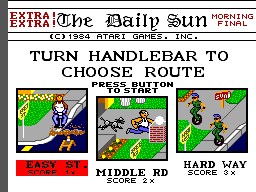 After the intro screens and a demo, you get to choose a difficulty level by picking easy, medium or hard street. The difference between them is the amount of obstacles to avoid, such as radio-control cars, cars, burglers, kids on tricycles, dogs and more. 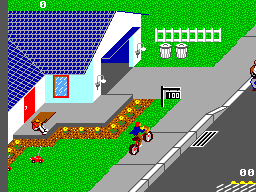 So to start playing, you ride up the road by pressing forward on the controller and shoot a paper by pressing button 1 or 2. The idea is to deliver your papers to the subscribers which are shown by bright houses and a mail box. 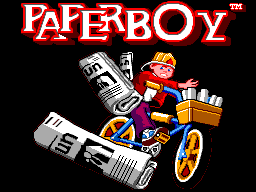 Just simply wham a paper in the mail box and then you're off onto the next house. On your way there are loads of things to avoid like those mentioned above and also static things like flower pots, fences, etc. Hitting anything other than the brakes will cause you to lose a life, however you do get four lives. This is a game to challenge friends with to see who can get the highest scores. Where this game fails a bit is the frustration that's built in. For instance, the extra paper packs are on the main road but you can only see a tiny bit of it and avoiding something in the road is nigh on impossible. However, this game plays so well that even though it's tough, it's very playable. The graphics are nice and bright and well drawn. The sprites are well animated too and look as close to the coin-op as you could expect. There is very little ficker, if any. The music is as good as we could hope for on the Master System and the sound effects of scoring, crashing and jumping are all okay too. Don't expect to hear any of the speech from the 16-bit versions though. Like I said, it plays spot on. Either on a control pad, stick or even the Mega Drive's Arcade stick. Which ever you chose will have you weaving all over the place. This game is quite tough at first but once you get the hang of it, it gets a little easier. Because it plays so well, you will come back for more and more. I love this game as it is a simple game to play but offers a good challenge and rarely leaves the side of my Master System. Best of all, it isn't rare and therefore doesn't command high prices. Go on, go and find the game now.